We’re very excited to be featured in this week’s edition of C-VILLE! Check out Cathy Harding’s Working Pour column for a profile on Scott Stinson and the historic Piedmont House at Stinson Vineyards. Welcome to Stinson Vineyards, a not-quite-yet vineyard and in-the-process historic renovation project. Follow us here to see our progress as one family takes on a neglected vineyard and country house at the foot of Virgina’s Blue Ridge Mountains.. Comments and feedback are welcome! Piedmont House is located in White Hall, Virginia, a small country town with amazing views of the Blue Ridge Mountains. It was built in 1796, and expanded to the current size in the 1840s. Local rumor has it that General “Stonewall” Jackson stayed at the house during his Valley Campaign of 1862. The property now consists of 15 acres, of which the vineyard will occupy 5. 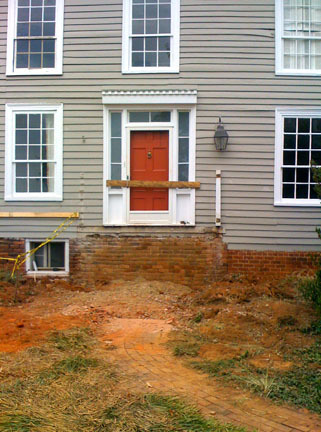 The house retains many of its original details and infrastructure despite the many renovations it has suffered over the years. The first vines at Piedmont House were planted about 40 years ago, in the 1970s. They primarily consisted of Cabernet Sauvignon. 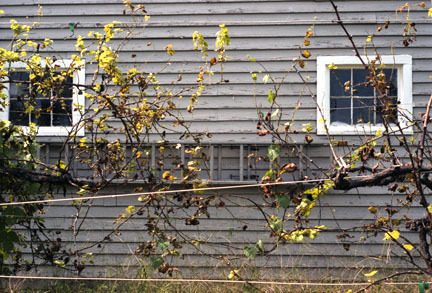 The vines fell into near total disrepair throughout multiple changes in owners. Diseased and neglected, the best move was to tear them out and start from scratch.